April weather − a mixture of sun, rain and fierce, choppy winds − appeared to have arrived two months early at Signal Iduna Park, where both teams made a cautious start to the game. 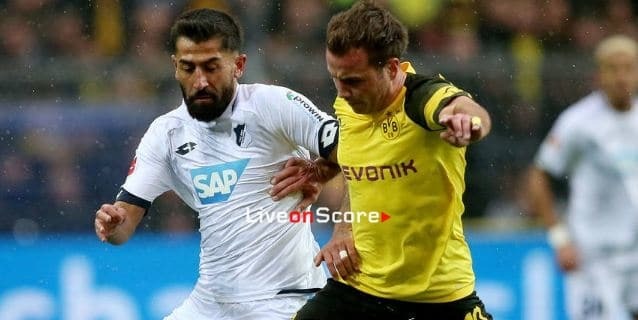 BVB were the superior side but initially couldn’t break down the visitors’ compact defence and get into shooting positions in the penalty area, although Philipp came close with an effort from 20 metres on the 20-minute mark. Arguably the biggest moment of the opening stages came on 11 minutes when Posch’s clearance rebounded off Sancho and into the net. But referee Fritz consulted VAR and decided Götze, who had been standing offside, had impeded Posch and that meant he was playing an active rather than a passive role. As a result, the goal was disallowed. Sancho was simultaneously the liveliest and most-fouled player on the pitch – but that did not stop the youngster from working his magic. On 32 minutes, he initiated the move that led to his “second” goal when he played a one-two with Pisczek before sprinting into the penalty area and directing a well-placed shot through the legs of a Hoffenheim defender that wrong-footed shot-stopper Baumann and nestled inside the far post. That lead was soon doubled thanks to a perfectly executed counter-attack on the stroke of half-time. Hakimi intercepted a Hoffenheim move with his chest in his own box and via Guerreiro and Sancho the ball found its way to Witsel, who found Dahoud on the left. Although Baumann saved his shot, he parried the ball into the path of Götze who was left with the task of a simple tap-in (43).